I have to be honest – this is my first time making homemade meatballs . . . and seriously, why haven’t I done this before?! They are easy! 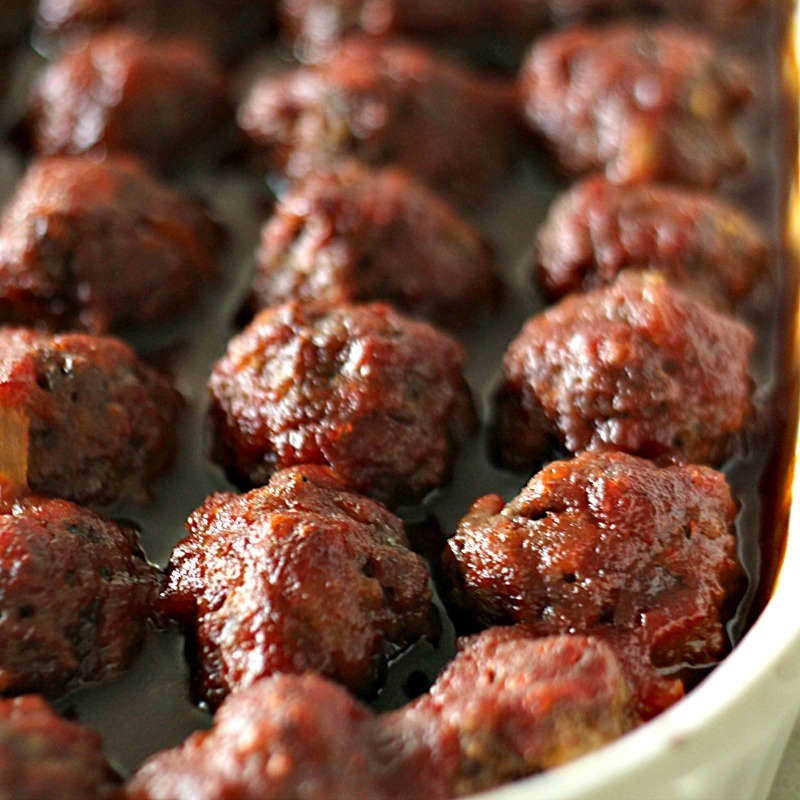 The meatballs are then topped with a sweet, sticky sauce (made of surprise ingredients – grape jelly?! Who would have thought?!) and baked until they are cooked all the way through. We put our meatballs on top of quinoa, but you could put them over rice or even poke a toothpick in them and serve as an appetizer! However you choose to eat them, they are delicious! Add olive oil to large saute pan then add the onions and bring to a medium-high heat. Season the onions with salt and cook for about 5 to 7 minutes. Add the garlic and the crushed red pepper and saute for another 1 to 2 minutes. Turn off heat and allow to cool. In a large bowl, combine beef, bread crumbs, milk, eggs, parsley, salt, pepper and crushed red pepper. Add in cooled onions. Mix well and form into golf-ball sized meatballs. Spray a 9x13" baking pan with non-stick cooking spray and place the meatballs in rows. In a small saucepan, combine the chili sauce and grape jelly over medium heat for 5-6 minutes, or until it starts to bubble. Pour sauce over meatballs and bake for 1 hour. Serve over quinoa, brown rice, or white rice with a side of steamed vegetables. Chili sauce is down the ketchup and sauce aisle at the grocery store. We have used Heinz Chili sauce as well as store brands and they all work well. I seriously just mixed up the sauce with grape jelly and the sweet chili sauce but haven't poured it on the meatballs!!! Yikes. Okay, going to get chili sauce now and then I'll report how they turn out :) Thanks! I made this last night and it is so delicious! It will feed my family of 3 (my husband, 18 month old, and me) for 3 whole meals. I steamed a side of broccoli and made cauliflower rice to put the meatballs on and it was so yummy. The only thing I may change for next time is making even more sauce to put over the meatballs, but it is also great as is. Thanks! Hi Heather! So glad to hear that they turned out. You sound like us, we like extra sauce on our recipes. You could easily double the sauce for these meatballs. Have a great week!! I am wanting to make these as an appetizer. Can you put them in a crock pot to keep warm until party time without drying them out? They should be fine in the slow cooker to stay warm. Hopefully you have a warm setting that is a lower temp than the low setting. Be sure your saucy liquid is in there with the meatballs. I just made these..and I used the wrong chili sauce(I used the really spicy kind with chili flakes!) so I just threw some spaghetti sauce in with it instead. I just wanted to add that you can cook these in an instant pot for 5 minutes (saute meatballs first)! They came out perfect! Cant wait to try the correct recipe!